1 Heat olive oil in a large nonstick skillet over medium-high heat and cook sweet potato with onion until vegetables are tender, about 5 minutes, stirring occasionally. Add ground beef, Knorr® Beef flavor Bouillon Cube and Garlic MiniCubes and cook about 5 minutes, until browned, stirring occasionally. Stir in remaining ingredients and simmer until slightly thickened, about 10 minutes, stirring occasionally. 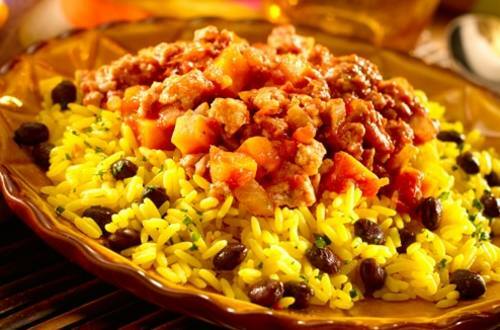 Serve with hot cooked rice and black beans.